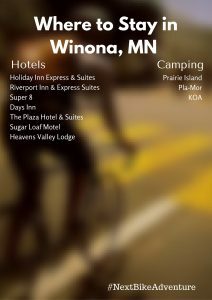 With scenic roads meandering in and out of the bluffs and trails that wind through hardwood forests, adventure-seekers and novices alike will find the Winona area a great place to come and ride. When not bicycling or hiking, the mighty Mississippi River beckons paddlers, boaters, and swimmers with its wide channels, intimate backwaters, and sunny beaches, Overall, it is a great place to cool off. As the sun drops down over Sugar Loaf Bluff, savor a great meal and raise your glass to all Winona has to offer. 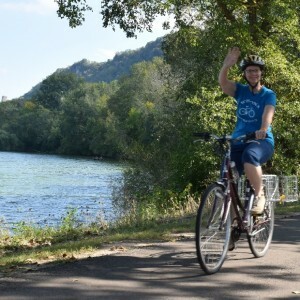 Biking around Lake Winona is a great way to enjoy the many cycling opportunities in Southeast Minnesota’s “Driftless Area”. The river valleys offer flat terrain, gently rolling hills ,and spectacular views of rivers and bluffs. Steep bluffs challenge those looking for a more vigorous adventure. Over a hundred miles of trails wind along the lakes, streams, woods and fields. In town, enjoy the family-friendly paved trail running along Lake Winona. For the touring cyclist, ride along the Mississippi River Trail and enjoy low traffic route loops with mileage options to meet your desires. There are many off-road trails with vista views and technical challenges for those looking for an adrenaline rush. Winona offers many activities from countless picturesque views to historic museums and everything in between. From several bakeries offering the nationally-acclaimed maple long johns to the popular Boathouse, this area offers several interesting and charming cafes, coffee shops, and ice cream shops ideally suited to a cyclist’s taste. For the most up to date listing click here. Along with most hotels, coffee shops and restaurants have Wi-Fi available. The public library is also good option. The Winona Public Library is located at 151 W. 5th St. in Winona and can be contacted at 507-452-4582. See the Winona Tourism Bureau for more detailed information.